This has been an interesting summer to be reviewing comics on GeekRex. While new comic books starting up is not a new thing by any means, it seems like there is a big boom in brand new comics. Some of these have been reboots a la Marvel NOW or The New 52, but there have been just as many if not more brand new comics from indie publishers to debut over the past year. Frankly, it is an exciting time to see the medium flourish with stories which seek to take advantage of the possibilities of comics. While it may not be a lot of fun for our wallets, it also helps that many of these new series are actually very good. 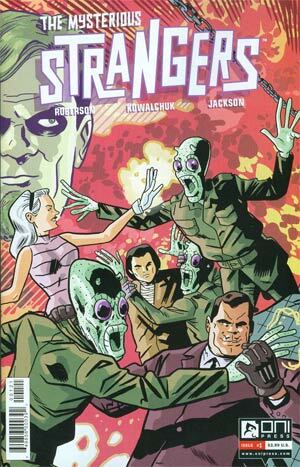 A comic series which started this week (for the most part) is The Mysterious Strangers by Chris Roberson. I had a familiarity with Roberson's work from reading his Cinderella standalone graphic novels set in the world of Vertigo series Fables, so I was more than willing to give his new story a chance. So, does The Mysterious Strangers live up to the high bar set by other new indie comics this summer, or does it fail so miserably it has no chance of survival? Meet the Strangers, a team of literal super spies, who use their special abilities to take out the bad guys. After taking out a virtual non-threat at a beauty pageant, the team is sent by their leader Absalom Quince to the Caribbean to investigate the recent actions of a country's president, who may be under the control of a villainous organization called O.C.C.U.L.T. Can the Strangers stop the group, or will this mission spell their doom? If you could not tell by the cover, The Mysterious Strangers is a pretty stylized comic. What is that style you ask? The best way to describe the way this comic is structured would be Charlie's Angels meets James Bond meets the X-men. In many ways, it feels like Chris Roberson writes this comic like it is a half hour episode of a television series. Not a television series today, mind you, but one that would have been most comfortable during the 1960's, the setting of the comic. Every trope of the spy television and films of that era is present here. A somewhat mysterious leader, the equally mysterious yet exciting team members, missions in exotic locales, and villains which feel like stock characters from a very cheesy comic book. Roberson sets this comic against the back-drop of the Cold War and does an excellent job of bringing in the well known elements of story-telling during that time. It's tempting to want to give the villains in this issue a Russian accent they feel like such clear 60's tropes. This is a stylistic choice on Roberson's part that may not work on many readers, but there is definitely an audience for a comic such as this. With the writing moves Roberson makes in structuring this comic, it would have been very easy for him to make the characters be quite bland, fulfilling only the archetypes expected of them. There are some characters where that is easily the case. Absalom Quince, the leader of the Strangers (their Charlie/M so to speak) definitely feels like a common trope, including his wheelchair. The villains in this issue (and the second, which released on the same day) are quite obviously caricatures of villains which were used during that time period, but there is just something about the way that they are written which makes them feel unique. Perhaps where Roberson's characterization feels more unique is in the fact that he has equipped the three members of this team with super powers that can only be transmitted through their hands. It is an interesting decision, especially since Roberson makes the excellent choice of SHOWING us what their powers do instead out outright TELLING, and one which could make for some intriguing future story-telling moves. Now, this is not a series which has characters of any depth, but Roberson does a good job of navigating the tight rope of engaging and archetype. In its opening story, Roberson makes his most obvious measures to make this feel like a 60's television series. Although this is our first glimpse of this world and these characters, this is an inaugural issue written like a series that is fifty issues in. For starters the story begins in media res, allowing for it to feel like you have stumbled upon this television show for the first time while flipping channels. From that beginning, the entire rest of this issue is written in a way which feels as if we have all been long time readers. It is a bold move on Roberson's part, many first issues do not make such a move as it is important for indie titles to quickly establish what the comic is going to be so as to bring in readers. Roberson definitely does these things, but he does it in a way which feels so different from other first issues we have seen this year. In terms of the actual story of this issue, it is one which expands in a much better way in the second issue, but this one gives us just enough time to grasp what this comic will be like. On the art side of things, Scott Kowalchuk does a more than excellent job of fitting in with the manner in which Roberson writes the comic. If Roberson's writing feels like the television shows of the era, Kowalchuk's art feels like some of the cartoons. It is an odd medley of tones, but it works excellently within this series opening issues. The pop art style of Kowalchuk's art puts the reader in just the right mindset to truly enjoy this fun new comic. Much like Roberson's writing, Kowalchuk's art may not work with everyone, but it certainly feels like a natural blending of creative powers. Whether or not you will enjoy The Mysterious Strangers depends on quite a few factors. Like most comics, it is all about what you expect when you open up that issue. If you like dark, gritty, emotional comics, you will probably not be satisfied here. If comics which take the time to build their characters and really explore the depth of their psychologies are more your flair, you will probably want to skip this one. But, if you like to take the time to read a comic which is just plain fun and doesn't take itself too seriously, chances are there is a lot you are going to enjoy about this series. Give Chris Roberson and Scott Kowalchuk your time and they will undoubtedly give you a comic which engages you for that short time you read it. Not something that can be said of every comic today. Summary: The Mysterious Strangers #1 introduces us to a love letter to the spy television of the 1960's with a story unique in it's structure, art that truly pops, and a comic that lets you have a darn good time.